I have been surprised how little I have found in the gadget department for women since I started this blog at the beginning of the year. My original intent of the blog was to highlight technologies that brought pleasurable experiences that didn't require overhead of learning or figuring out what/how to get the experience. 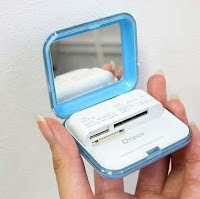 Well, today I found on http://www.slashgear.com/ a blog post that highlights a girl gadget that's simple and useful - it's a compact mirror that has a built in usb and a card reader inside. I think it's a pretty neat combination of features. The writer is pleased to find it doesn't come in pink, me too.